Will is a computer scientist and is enthused by nearly all aspects of the technology domain. He is specifically interested in mobile and social computing and is currently a researcher in this area at Cardiff University. Web applications often require the ability to allow users to upload files such as images, movies and archives. Amazon S3 is a popular and reliable storage option for these files. This article demonstrates how to create a Node.js application that uploads files directly to S3 instead of via a web application, utilising S3’s Cross-Origin Resource Sharing (CORS) support. The Express web framework is used to facilitate request-handling in the examples below, but the procedure should be almost identical in any Node.js application. A complete example of the code discussed in this article is available for direct use in this GitHub repository. The main advantage of direct uploading is that the load on your application’s dynos would be considerably reduced. Using app-side processes for receiving files and transferring to S3 can needlessly tie up your dynos and will mean that they will not be able to respond to simultaneous web requests as efficiently. An example simple account-editing scenario is used as a guide for completing the various steps required to accomplish the direct upload and to relate the application of this to a wider range of use-cases. More information on this scenario is provided later. S3 is comprised of a set of buckets, each with a globally unique name, in which individual files (known as objects) and directories, can be stored. For uploading files to S3, you will need an Access Key ID and a Secret Access Key, which act as a username and password. The access key account will need to have sufficient access privileges to the target bucket in order for the upload to be successful. Please see the S3 Article for more information on this, creating buckets and handling your authentication keys. The browser then uploads the file directly to Amazon S3 using the signed request supplied by your Node.js application. This guide includes information on how to implement the client-side and app-side code to form the complete system. After following the guide, you should have a working barebones system, allowing your users to upload files to S3. However, it is usually worth adding extra functionality to help improve the security of the system and to tailor it for your own particular uses. Pointers for this are mentioned in the appropriate parts of the guide. The signature generation on the server uses AWS’s official SDK, as explained later. Please see their documentation for information on the features of this SDK. You have AWS authentication keys that have write access to the bucket. You will now need to edit some of the permissions properties of the target S3 bucket so that the final request has sufficient privileges to write to the bucket. In a web-browser, sign in to the AWS console and select the S3 section. Select the appropriate bucket and click the ‘Properties’ tab. Select the Permissions section and three options are provided (Add more permissions, Edit bucket policy and Edit CORS configuration). CORS (Cross-Origin Resource Sharing) will allow your application to access content in the S3 bucket. Each rule should specify a set of domains from which access to the bucket is granted and also the methods and headers permitted from those domains. Click 'Save’ in the CORS window and then 'Save’ again in the bucket’s 'Properties’ tab. This tells S3 to allow any domain access to the bucket and that requests can contain any headers, which is generally fine for testing. When deploying, you should change the 'AllowedOrigin’ to only accept requests from your domain. If you wish to use S3 credentials specifically for this application, then more keys can be generated in the AWS account pages. This provides further security, since you can designate a very specific set of requests that this set of keys are able to perform. If this is preferable to you, then you will need to configure your IAM users in the Edit bucket policy option in your S3 bucket. There are various guides on AWS’s web pages detailing how this can be accomplished. The tool will ask some questions about your app, including its name, description, licensing, and version-control, and create a file called package.json in the app’s root. This file uses your responses to maintain information about your app, which you can edit freehand as you develop further. Use of these packages will become clear later, and installation of them in this way allows for greater control of your per-app dependencies as your apps grow. Using config vars is preferable over configuration files for security reasons. Avoid placing passwords and access keys directly in your application’s code or in configuration files. Please see the article Configuration and Config Vars for more information. Setting up local environment variables for your app is useful for running and testing your app locally. For more information, see the Set up your local environment variables section of the Heroku Local article. Information on launching your app locally is provided later in this article. Remember to add the .env file to your .gitignore, since this file should only be used for local testing. The processes and steps required to accomplish a direct upload to S3 will be demonstrated through the use of a simple profile-editing scenario for the purposes of this article. 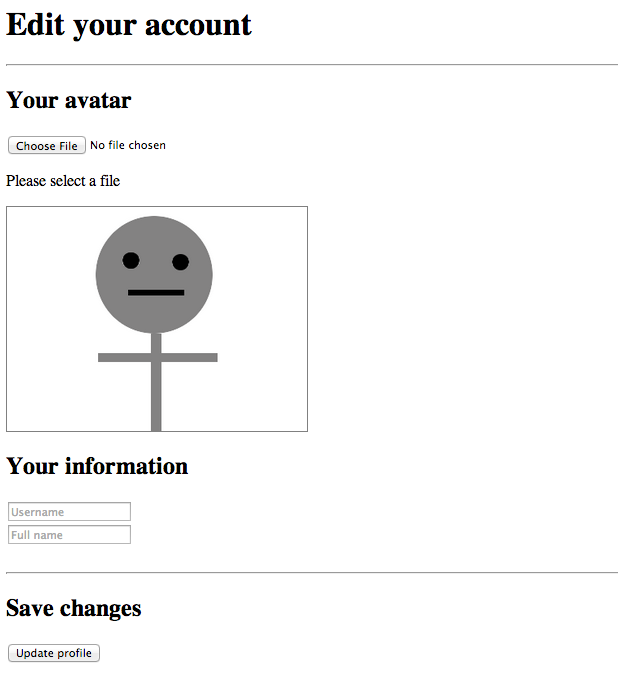 This example will involve the user being permitted to select an avatar image to upload and enter some basic information to be stored as part of their account. The user is presented with a web page, containing elements encouraging the user to choose an image to upload as their avatar and to enter a username and their own name. An element is responsible for maintaining a preview of the chosen image by the user. By default, and if no image is chosen for upload, a default avatar image is used instead (making the image-upload effectively optional to the user in this scenario). When a user selects an image to be uploaded, the upload to S3 is handled automatically and asynchronously with the process described earlier in this article. The image preview is then updated with the selected image once the upload is complete and successful. The user is then free to move on to filling in the rest of the information. The user then clicks the “submit” button, which posts the username, name and the URL of the uploaded image to the Node application to be checked and/or stored. If no image was uploaded by the user earlier the default avatar image URL is posted instead. No third-party code is required to complete the implementation on the client-side. To see the completed HTML file, please see the appropriate code in the companion repository. Thus when the user finally clicks the submit button, the URL of the avatar is submitted, along with the username and full name of the user, to your desired endpoint for server-side handling. To accomplish this, first create a <script> block and write some code that listens for changes in the file input, once the document has loaded, and starts the upload process. The code also determines the file object itself to be uploaded. If one has been selected properly, it proceeds to call a function to obtain a signed PUT request for the file. Next, therefore, write a function that accepts the file object and retrieves an appropriate signed request for it from the app. If the name (file.name) and/or mime type (file.type) of the file you upload contains special characters (such as spaces), then they should be encoded first (e.g. encodeURIComponent(file.name)). This function accepts the file to be uploaded, the signed request, and generated URL representing the eventual retrieval URL of the avatar image. The latter two arguments will be returned as part of the response from the app. The function, if the request to S3 is successful, then updates the preview element to the new avatar image and stores the URL in the hidden input so that it can be submitted for storage in the app. Now, once the user has completed the rest of the form and clicked submit, the name, username, and avatar image can all be posted to the same endpoint. If you find that the page isn’t working as you intend after implementing the system, then consider using console.log() to record any errors that are revealed inside the onreadystatechange function and use your browser’s error console to help diagnose the problem. It is good practice to inform the user of any prolonged activity in any form of application (web- or device-based) and to display updates on changes. Therefore a loading indicator could be displayed between selecting a file and the upload being completed. Without this sort of information, users may suspect that the page has crashed, and could try to refresh the page or otherwise disrupt the upload process. This section discusses the use of Node.js for generating a temporary signature with which the upload request can be signed. This temporary signature uses AWS authentication credentials (the access key and secret key) as a basis for the signature, but users will not have direct access to this information. After the signature has expired, then upload requests with the same signature will not be successful. To see the completed Node file, please see the appropriate code in the companion repository. In some scenarios, it may be necessary to check that the environment’s PORT var is a number by using Number(process.env.PORT). The packages installed with npm are imported at the top of the application. The Express app is then set-up and finally the bucket name is loaded from the environment. Remember to use the region that your target bucket resides in. If you need it, use this page to find your region. This code uses the aws-sdk module to create a signed URL that the browser can use to make a PUT request to S3. In addition, the prospective URL of the object to be uploaded is produced as a combination of the S3 bucket name and the object name. This URL and the signed request are then returned to the browser in JSON format. Initialising the s3 object automatically loads the AWS_ACCESS_KEY_ID and AWS_SECRET_ACCESS_KEY variables that were set into the environment earlier. You may wish to assign another, customised name to the object instead of using the one that the file is already named with, which is useful for preventing accidental overwrites in the S3 bucket. This name could be related to the ID of the user’s account, for example. If not, you should provide some method for properly quoting the name in case there are spaces or other awkward characters present. In addition, this is the stage at which you could provide checks on the uploaded file in order to restrict access to certain file types. For example, a simple check could be implemented to allow only .png files to proceed beyond this point. This function is currently just a stub that you’ll need to complete in order to allow the app to read and store the submitted profile information and to correctly associate it with the rest of the user’s account details. You will need a Procfile for this to be successful. See Getting Started with Node.js on Heroku for more information. Also remember to correctly set your environment variables on your own machine before running the application locally. 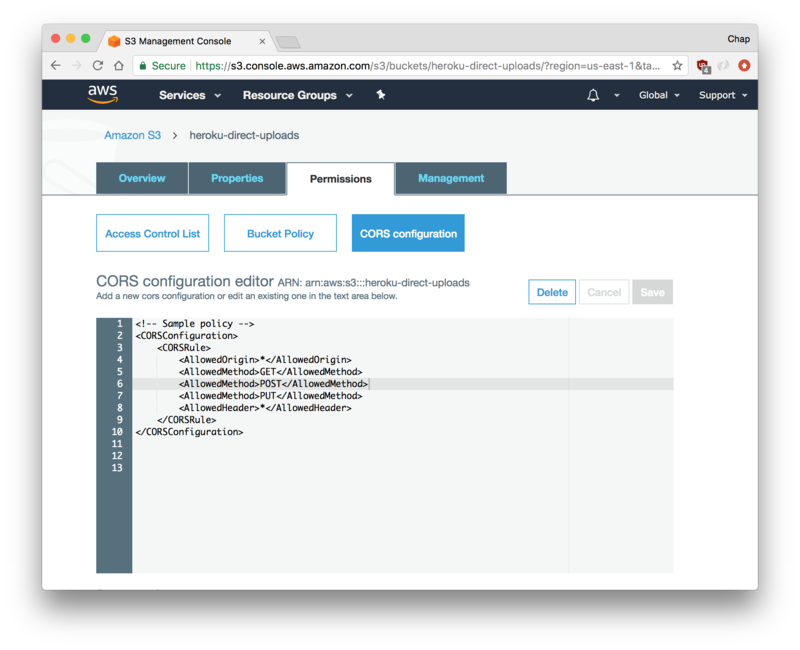 This article covers uploading to Amazon S3 directly from the browser using Node.js to temporarily sign the upload request. Although the guide and companion code focuses on the Express framework, the idea should easily carry over to other Node applications.